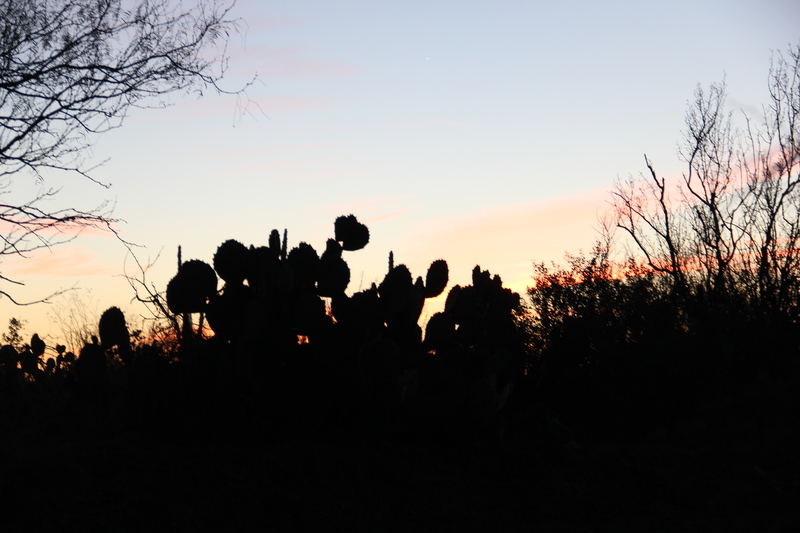 In the beginning of November I travelled to the eastern and central parts of Eagle Ford. I have now complemented that trip by visiting the western part. The USA’s western border in Texas stretches along the Rio Grande and the western border of Eagle Ford stretches between the towns of Eagle Pass and Laredo. The northern part has oil and the southern part dry gas. Between them one finds condensate and a mixture of oil and natural gas. We travelled south on IS35 and then drove west out on road 57 a little north of Pearsall towards Eagle Pass (If you wish you can follow our route on Google Map). Road 57 marks the northern border of Eagle Ford. Since we could only travel on public roads we had to look everywhere we could to find fracking activities. We saw some drilling rigs but mainly we saw trucks bearing water, sand and chemicals. There were also signs advertising land to lease and water to buy. When one looks at a map showing the location of wells one sees that they appear very densely distributed. In reality, each well is a small dot and the distance between each drilling site is quite great. One aim of our trip was to visit Crystal City. Since the beginning of the 1900s the town is known as the world’s capital city for spinach. For 100 years they have filled cans with spinach and Pop-Eye has tried to convince us to eat it. 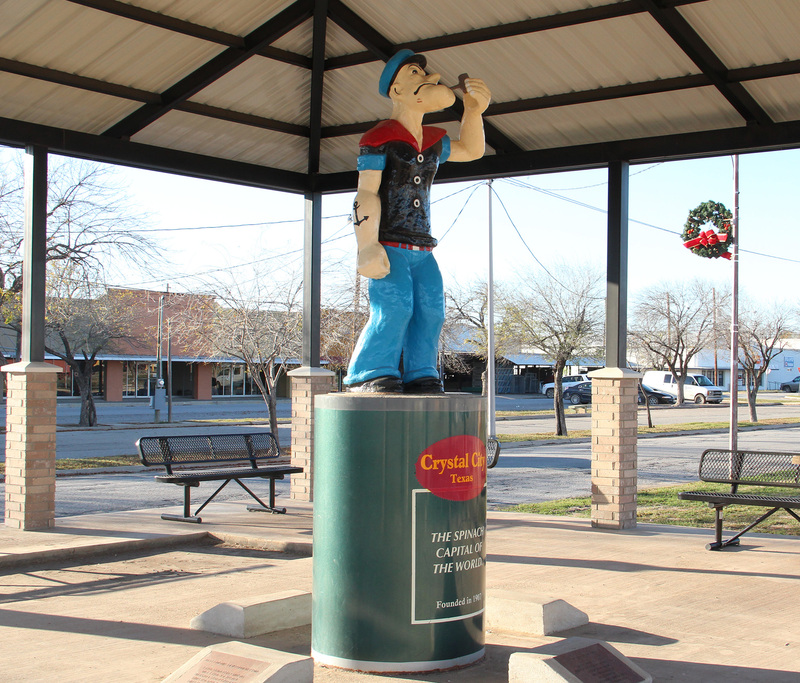 Crystal City with its 7,000 inhabitants lies in the middle of western Eagle Ford and it is already being spoken about as the next boom town in Texas. (Read Wikipedia regarding the internment camp for the Japanese, Germans and Italians during WWII.) In future they will not only be filling cans with spinach but also larger cans, drums, with crude oil. When we drove around the town there was no doubt that it had seen better days but indications of a different future were new areas for parking mobile homes and newly built barracks where one could hire a room. 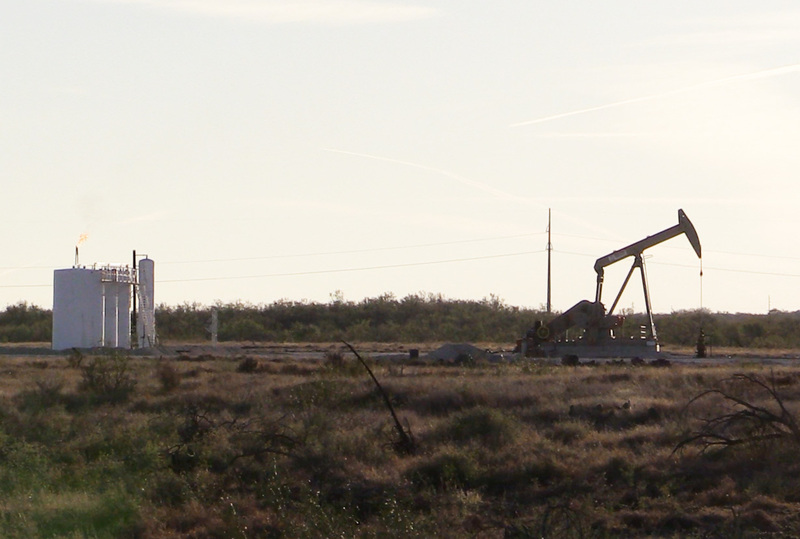 Western Eagle Ford is an enormous area and there is room for thousands of new wells. 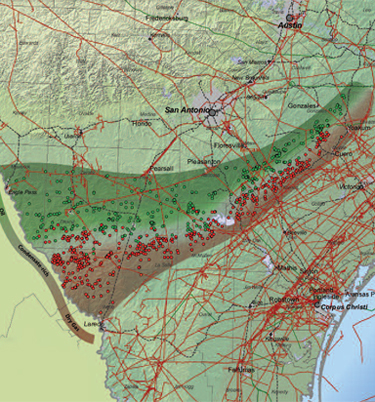 If the price of natural gas rises then even the southern areas will be drilled and the entire area will become a new “black gold-rush” area. A little south of Crystal City I filmed my most westerly oil pump in Eagle Ford and the truck traffic supporting fracking activities increased markedly. At the end of December there were 269 drilling rigs in Eagle Ford and those wells that have been drilled will then be fracked. Every fracking site has at least 20 trucks present, many delivering products and equipment so let’s assume that every rig and each site’s subsequent fracking activities requires 40 trucks. If that is the case then 12,000 trucks are required to service Eagle Ford’s fracking activities. Everywhere one can see parking spots for trucks and trucks in motion. The various wells are not connected by a pipeline but, rather, most of the oil is collected in cisterns near the wells’ pumps (see the image above). A tanker truck can carry approximately 40,000 litres or 250 barrels of oil. If a tanker truck makes four collections per day this will amount to 1,000 barrels. If 500,000 barrels is to be freighted every day that will require 500 trucks. Of the approximately 160,000 new jobs created in the area, truck driver is one of the most common. What I have written above is a very crude estimate but it gives us an idea of what is required to produce one million of the 19 million barrels of oil per day that the USA consumes. In Three Rivers there was a large collection station for oil and they are now planning to build a pipeline from this station to a suitable refinery. 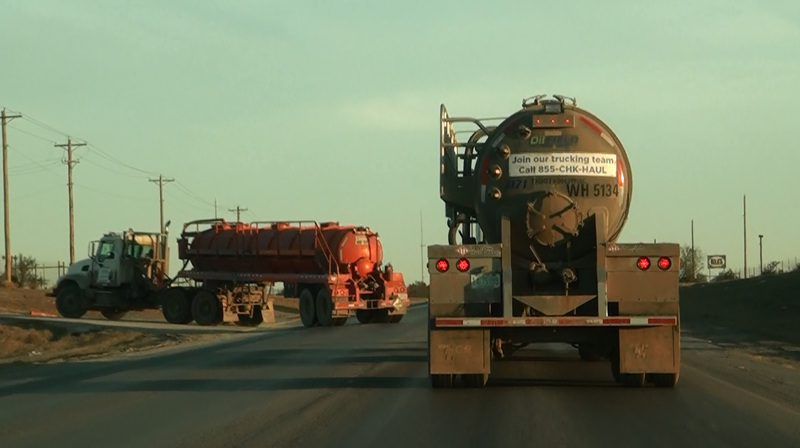 The surrounding roads are showing very significant wear and tear and a current political discussion is what increased fees will be required for road maintenance in Texas. 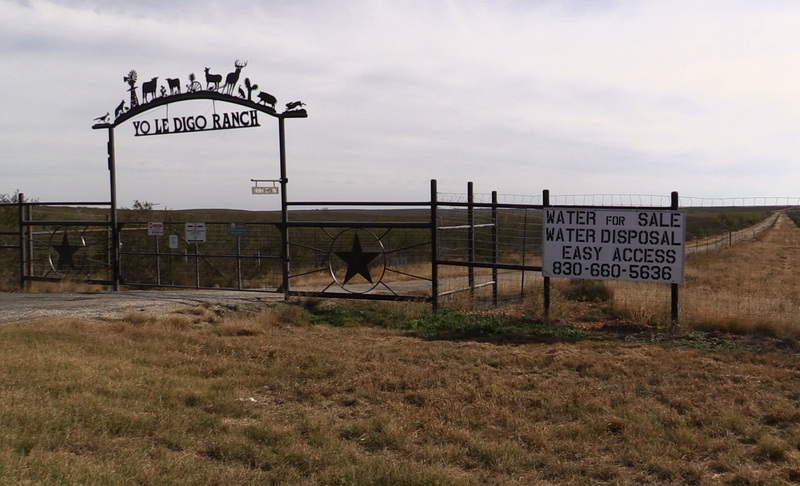 Our final goal of the day was to reach Rio Grand and Laredo that mark the southern border of Eagle Ford. We travelled along road 133 out to IS35 and there the activity was markedly greater. That the southern region produces gas was displayed by the fact that we began to see compressor units for pressurisation of gas pipelines. The next day we travelled south along the Rio Grande and even there they were planning for fracking. The most common sign there as in all of Eagle Ford was closed gates to the various sites. The image above is of an entrance to a large area with many operators. During a number of days I have travelled through all of Eagle Ford. Obtaining “on location” information on these activities is very important! The fact that the shale area, in principle, stretches across the entirety of Texas means that its area is enormous. The thousands and thousands of wells that have been drilled are scattered here and there but one cannot state that they have markedly changed the landscape when one drives along the highway. If one uses Google Map to look for Three Rivers in Texas one can follow IS37 north and then road 99 east using the satellite image. Then one can see fracking sites in an area where they are most dense. This activity will expand over all of Eagle Ford and many experts that I have spoken with mention that Eagle Ford will achieve a maximal production of 1.5 Mb/d. In ten years the peak will be passed and production will then decline. The now overfull parking areas for mobile homes and trailers will empty. The barracks will possibly remain as memorials to today’s oil rush. “Boom” will have been transformed to “bust”.